In pot at Iao Tropical Gardens of Maui, Maui, Hawaii (USA). May 22, 2012. Origin and Habitat: Phoenicophorium borsigianum is endemic and fairly widespread to the Seychelles in the Indian Ocean, and occurs on the eight islands Mahé, Praslin Silhouette, La Digue, Frégate, Curieuse, Félicité and St. Anne. These islands have a total area of 235 km2 (National Statistics Bureau 2005). The extent of occurrence is less than 5,000 km2 and the area of occupancy is smaller than 500 km2. Ecology: This palm has prominent spines on their stems and leaf bases, a feature generally thought to be a defense against the giant tortoises that used to roam free in the islands. The large leaves provide shelter for geckos and invertebrates as the pleated surface acts as an effective litter trap thus providing cover for small animals. Description: The thief palm, Phoenicophorium borsigianum, is the the only species in its genus, and represents a unique evolutionary lineage for the Seychelles. 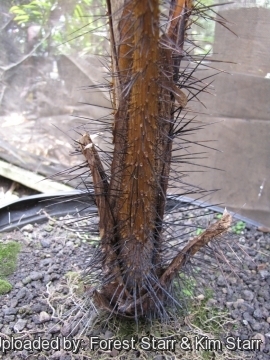 It is a fairly tall, solitary, slender spiny palm to about 15m high with enormous undividied but indented leaves and was for some time called Stevensonia borsigiana but it has subsequently been renamed Phoenicophorium borsigianum. It is a monoecious palm, both male and female flowers are borne on the same tree on an inflorescence that emerges below the crown. Similar species: It is similar in appearance to a Pelagodoxa henryana, only with more oranges and yellows in petioles and stems. Stems: Heavily ringed with leaf scars, formed by the loss of leaves, bearing black spines on younger plants, ± unarmed at maturity. Leaves: Up to two metres in length. Lamina entire (except what wind damage does- which is actually the norm), deep emerald green, though the new leaves are a deep maroon, crinkled in appearance due to the prominent veins, and (bifid) split at the ends with orange-edged serrations. 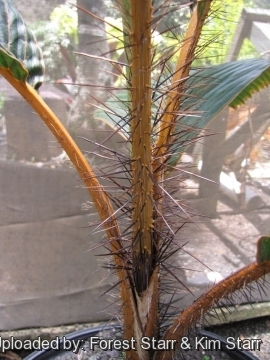 Petiole orange up to half a metre long and armed with black spines. Inflorescences: Interfoliar, branching to 1-2 orders, protandrous; prophyll inserted above base, persistent, peduncular bract included within prophyll; rachillae flexuous, bearing spiral triads, except distally staminate. . Male flowers: Asymmetrical, closed in bud; stamens 15-18, anthers elongate, medifixed, latrorse; pistillode absent. Staminodes 6. Fruit: Small, oval range in colour and may be up to 1.5 cm long. Endocarp thin, operculum round, basal. Seed: Basally attached, hilum rounded; endosperm ruminate; embryo basal. Seedling: Eophyll (seedling leaves) entire. 1) Ismail, S., Huber, M.J. & Mougal, J. 2011. Phoenicophorium borsigianum. The IUCN Red List of Threatened Species. Version 2014.2. <www.iucnredlist.org>. Downloaded on 01 September 2014. 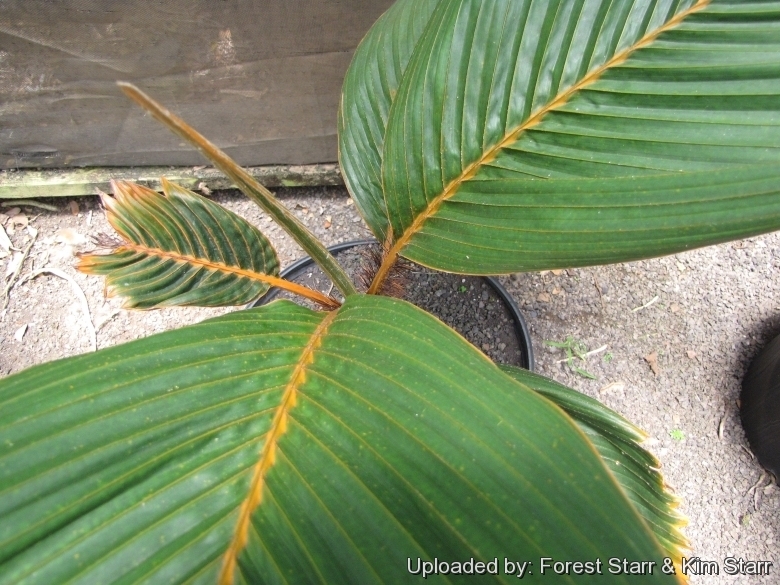 4) Forest & Kim Starr Phoenicophorium borsigianum (Theif palm, latanier feuille). Plants of Hawaii. <http://www.starrenvironmental.com>. Downloaded on 21 August 2014. 6) Govaerts, R. & Dransfield, J. “World Checklist of Palms”. The Board of Trustees of the Royal Botanic Gardens, Kew. 2005. 16) This article incorporates text from the ARKive fact-file "Phoenicophorium" under the Creative Commons Attribution-ShareAlike 3.0 Unported License and the GFDL. Cultivation and Propagation: Phoenicophorium borsigianum is an exytremely beautiful, somewhat easy palm to grow but very cold sensitive. It is absolutely gorgeous and not overwhelmingly big. It is adapt to the humid tropical climates, but is capable of withstanding full sunlight and periods of drought. It elegant foliage and small stature make it suitable for a smaller landscape, where it is best as a single specimen rather than a group. People who live in colder climates can still enjoy the palms as potted plants. It is a popular collectors palm that adds grace to the garden..
Growth rate: Usually grows relatively fast in favourable tropical climates. Soil requirements: It has a fibrous root system and benefits from deep organic, soils that are fertile as long as they are well drained. Watering: It prefers adequate moisture to look its best, but is capable of withstanding periods of drought. Don't let sit in water. Indoor, potted palms should not be over-watered. Light: Likes a sunny or half-shaded, sheltered position. If home-grown, give some sun as with most tropical palms. 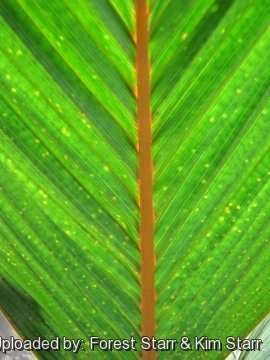 Although a plant of the deep rainforest, it can stand almost full sun from quite an early age. Fertilization: Need a perfect fertilizer diet including all micro nutrients and trace elements three times a year if not grown in rich soil. Hardiness: This palm is tender and is suited for tropical or subtropical climates, and not like cold. Seedling growth arrests below 15° C.
Wind hardiness: It is not tolerant as the fronds tatter easily and requires wind-sheltered spots. Garden uses: This palm has only recently been introduced to cultivation, but is becoming very popular in the tropics and sub-tropics as a garden and container plant. It is an excellent landscaping palm when set among taller trees as a specimen but is even better when multiple plants are grown together. 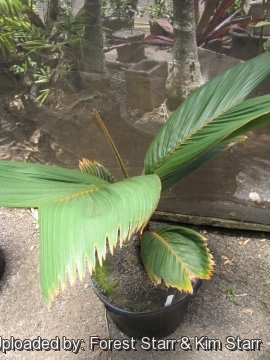 It is specially for small gardens where other palms will grow out of scale. Plant this palms in containers and feature it in a prominent spot on the patio. Other uses: The leaves have been extensively used in the past for thatching of roofs. For tourist infrastructure this practice has a renaissance. Propagation: The fresh seeds take 4-6 months to germinate. If not properly treated, the seed does not have long shelf life. Shade and abundant moisture for seedlings and juveniles is essential in a very well protected area if the leaves are to retain their fullness, as they are easily split and spoiled by wind.